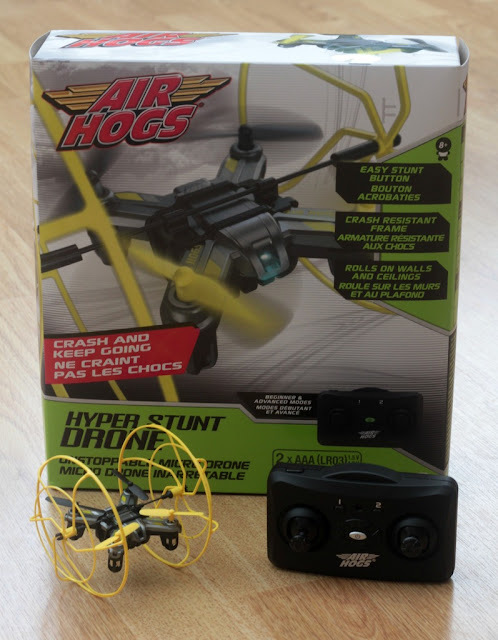 I think I was just as excited as my 9 year old when I told him that we were being sent an Air Hogs Hyper Stunt Drone to review. He had recently been asking if we could get one and I stalled him with the "lets put it on the Birthday list" excuse. If you have been looking at getting one yourself you will see that there is some variability in reviews. The instructions are adequate but a little confusing, mainly as all languages are written together. 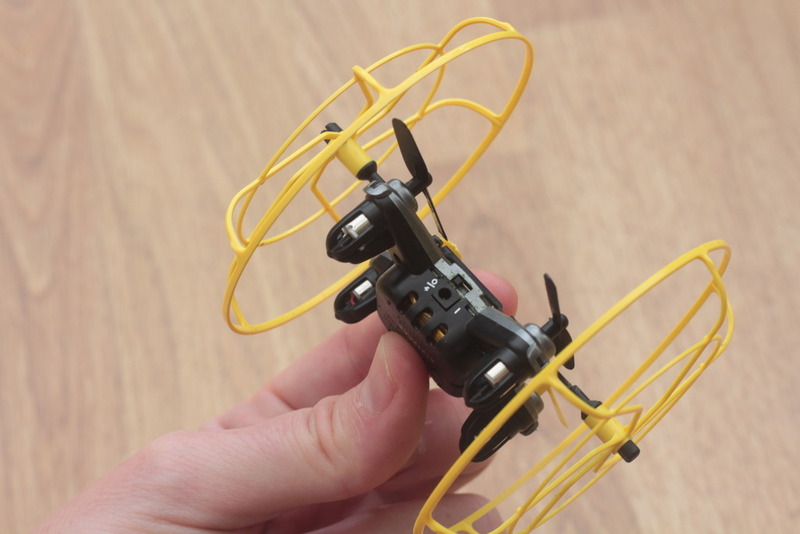 The drone can be flown as it is, or with the roller cage. The advantage of the roller cage is that you are less likely to break the rotor blades and you can (with some practice) get it climbing up walls and across the ceiling. First you need to charge the drone. This is done using a USB lead. The controller needs fitting with two AAA batteries. When you turn on both you need to flick the throttle so that it will pair and then it should start to fly when you hit the throttle. We had a few hiccups with using the hyper stunt drone. After it initially flew, it then gave up and just rolled around the ground. It took me ages to work out what was wrong, but it appeared than when it had crashed it had got some dust or hair stuck in the rotors. Once I took them off and cleaned them, it flew again. The key to the enjoyment of this toy, is learning to fly it without breaking the rotor blades. We have broken two and have 2 spare ones left. I would therefore recommend that whilst you are learning to fly the drone, you keep it inside the roller cage as this will protect the part more. There is no doubt that this is a fun toy and that applies to adults too! The age rating of 8+ is appropriate as younger children could easily break it. Only time will tell, to see how long it takes before we break all of the spare rotor blades that come with it. In short, really fun but takes practice to fly and finds all matter of tiny dust particles and hairs that are in your house.